e-Wallets have been created with user’s security in mind and since they provide an extra layer of protection between you and a bookmaker you plan to deposit money at, they’re a great option for security-conscious punters. 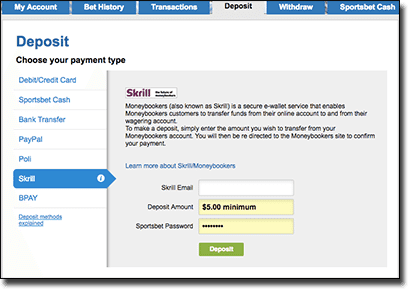 One common e-Wallet for gambling transactions, due to both their policy and being widely available at bookies, includes Skrill – formerly known as Moneybookers. Users can open an account with their details, fund the virtual wallet, and then use the email address and self-generated password to make a deposit at a bookmaker to then place real money bets. We detail the best sites to use the e-Wallet at, and everything else you need to know about Skrill. Aussies after reputable bookmakers can legally punt at the following Skrill sites, each of which adhere to Australian state regulations. You will first need to open an online Skrill account before you can make a deposit at any of the aforementioned sites. To do this, simply head to Skrill.com and click or tap the sign up button and register your details. You can choose your currency out of the 40 available, including AUD. Connect your virtual account with a payment method of your choice from local options including a bank transfer, Neteller (another popular e-Wallet), and POLi – or a global option such as Visa, MasterCard, AMEX, Diners Club and JCB credit, debit and prepaid cards, as well as Swift. There may be fees involved when funding your Skrill account, depending on the method you choose, but local bank transfers are fee-free. You will then need to have an online account with one of the aforementioned betting sites – click the links above to sign up in just a few minutes. From here, you will need to go to the cashier and locate the Skrill logo. Then enter the amount you wish to deposit, your Skrill username and password (generated when you opened a Skrill account), and confirm the deposit. Your payment will be processed instantly and appear in your bookie account to use immediately. If you have any successful punts and wish to withdraw your funds, you can do so with Skrill too. Simply head to the withdrawals section of the cashier. Skrill may be your default withdrawal method if you used it to deposit, or you may have to re-select it. Enter your details and confirm the transaction. Your funds will then be transferred from your punters account to your Skrill account, where you can store it to use at a later date or then transfer it back to your personal account – bank transfers between your accounts are processed instantly. You can also opt for a Skrill Prepaid MasterCard which can be used to withdraw funds from your Skrill account at MasterCard participating ATMs. What about Skrill 1-Tap on mobile? Skrill 1-Tap is our recommended mobile bookmaker deposit option. Once you have made your first deposit at your preferred verified bookmakers, you can opt for the Skrill 1-Tap service – created predominantly for smartphone and tablet users (Android, iPhone, iPad, Samsung, etc), but desktop computer and laptop users can use it too. All you have to do is opt in for the Skrill 1-Tap option if it is available from the deposit list after you’ve made your first deposit. Then, the next time you make a deposit you will only have to click or tap confirm – no need to enter any usernames or passwords. Only opt in for this if it is available at the aforementioned bookies. Bet365 supports Skrill 1-Tap as this site is safe and will keep third parties from gaining access to your details and funds. The best part about using Skrill to gamble online is when you make a deposit or withdrawal at the secure sites listed above you won’t incur any fees by the bookies. However, if you use your credit or debit card to fund your Skrill account, and then make a deposit with the e-Wallet, your card issuer may notice this and charge a cash advance fee – but only if they impose this policy for gambling transactions. Additionally, there are fees incurred when funding your Skrill account and withdrawing from it, so the entire process isn’t completely fee free. All sites offer AUD so there’s no currency conversion involved, and therefore no fees in this respect. Additionally, if you do not login or make a transaction within 12 months you will be charged the AUD equivalent of EUR 1.00 each month, so be sure to keep your account active. Skrill emerged in 2001 under the brand Moneybookers and by 2008 it was offered in over 200 countries. However, the private financial firm catapulted into the spotlight when Facebook, eBay, and Skype adopted the method between 2009 and 2011 – this resulted in the firm rebranding their service to their current name, Skrill. The rebranding occurred at the same time the service was deemed UK’s fastest-growing private-equity-backed company in 2010, but still continued to grow adding the unique Skrill 1-Tap service in 2012. In 2013, Skrill acquired paysafecard and then Ukash in 2014, merging the two unique prepaid voucher methods under the one name: paysafecard. Today, Skrill is used in around 200 countries, with more than 40 currencies available, and will no doubt continue to grow as an online payment service. Is Skrill safe to use for online AUD bookie deposits? Skrill is incredibly secure utilising the same technology financial institutions use to protect user’s personal and financial information. The e-Wallet also acts as an extra layer of protection when making deposits and withdrawals. When used at regulated and verified bookmakers, such as the four we’ve detailed above, you can be assured all transactions made are secure so you can punt online with real money safely.